Mrs. Thompson was born in Jackson, Mississippi, raised in Mobile, AL. 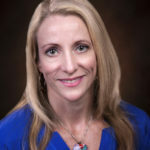 She received a Bachelor of Science in Biology from the University of Mobile in 1997 and a Master of Health Sciences in Physician Assistant Studies from the University of South Alabama in 2000. She has been employed by Gastroenterology Associates, Sacred Heart Division, since 2000. Mrs. Thompson has also been the Manager for the Sacred Heart Office since 2005.